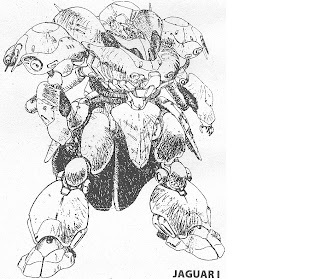 Pms-007 Jaguar I have a very big and massive torso, so from the few pics that I have I scratched the torso internal frame. This is the result after primer and sanding. I started from a simple base that i made in pla-plates.. This is my first 2012 post and I'm very happy to present to you my new project. PMS-007 Jaguar 1 is an heavy ground Ms created from Kazuhisa Kondo and is my 2012 MAC Forums entry. I started from the head. So I made a Sazabi resin copy. here the modding result. I have used pla-plates, milliput and Sintolit.